While we have access to any type of aircraft you need, our primary fleet includes Cirrus aircraft with 3 passenger seats and PA31-350 Navajo Chieftains with up to 7 passenger seats. with two passenger seats in the rear and one next to the pilot. 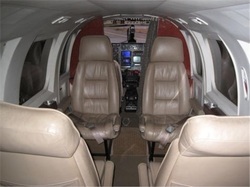 The twin engine Piper Navajo Chieftain is a roomy aircraft with executive club seating and plenty of leg room. There are fold out tables between the four seats for your dining or meeting planning. 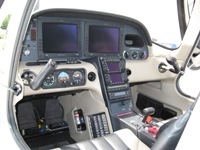 Two more seats are aft and a seven is in the cockpit next to the Pilot.